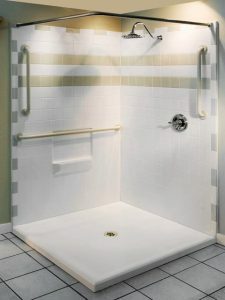 This gorgeous 48″ by 48″ barrier-free shower delivers all of the essentials and requisites for your showering needs. 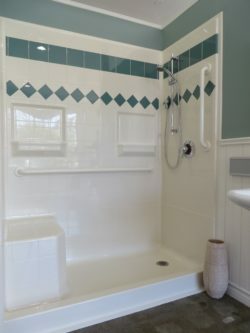 Designed with a 2.25 inch beveled finish and center drain, this luxurious fiberglass shower delivers a ‘RealTile’ look that is further complimented by a polyester gel coat finish. 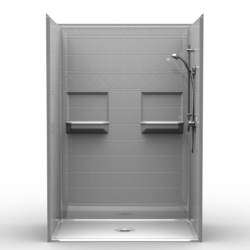 Along with its wonderful aesthetics, this shower’s full plywood backing also delivers outstanding strength and performance, and allows for easy customization and accessory installation, such as bars or seats. Mud settings are eliminated with a self-supporting pre-level bottom. The low shelf is optimal wheelchair users and the simple snap-in-place installation allows for an easy and stress-free installment. Its practical design allows for easy entry, whether you are a senior or disabled, and looks great in any home.